Character Assassin: Lieutenant Colonel Mohamed Samraoui testified in mid-2007 to New Zealand’s Inspector General for Security & Intelligence that he had framed Algerian academic and asylum seeker Ahmed Zaoui as a terrorist. On 4 December 2002, Algerian refugee Ahmed Zaoui was detained at New Zealand Customs after he had torn up his passport at 32,000 ft and flushed the pieces down one of the passenger jet’s toilets. Zaoui was seeking political asylum partly because he had been sentenced to death in an Algerian Court, where he was tried in absentia for terrorism charges, weapons trafficking and for being a guerilla leader. Zaoui was also seeking a new life in the South Pacific country of New Zealand, partly because the French, Swiss and Belgium authorities had joined in the persecution. Also, because he thought the South Pacific country’s geographical isolation would afford the authorities political distance, a learned investigation and abstemiousness. 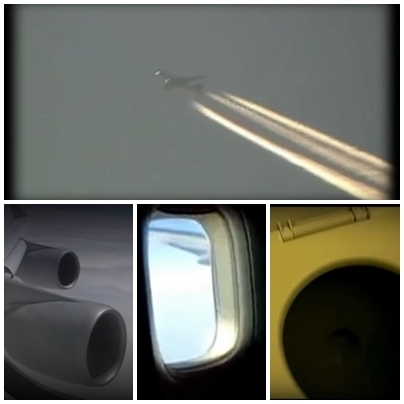 Paperwork Disposal: Algerian academic Ahmed Zaoui tore up a fake passport before flushing the pieces down a toilet aboard a jet en-route the New Zealand on December 4 2002 and sought political asylum upon arrival. Unfortunately, Zaoui had believed the South Pacific Neo-Colonial state’s tourist marketing. The Algerian-born asylum seeker’s actual sin was he had been a member of a political party, the Front Islamique du Salut or Islamic Salvation Front (FIS), which in late 1991 won the majority of Algerian Parliament’s seats. The Algerian military regime not only found this election win intolerable and cancelled the election result. The Algerian military dictatorship hunted down FIS members and the most unfortunate souls were imprisoned, tortured and murdered. Amid the mayhem, Ahmed Zaoui fled Algeria for Europe in 1993. 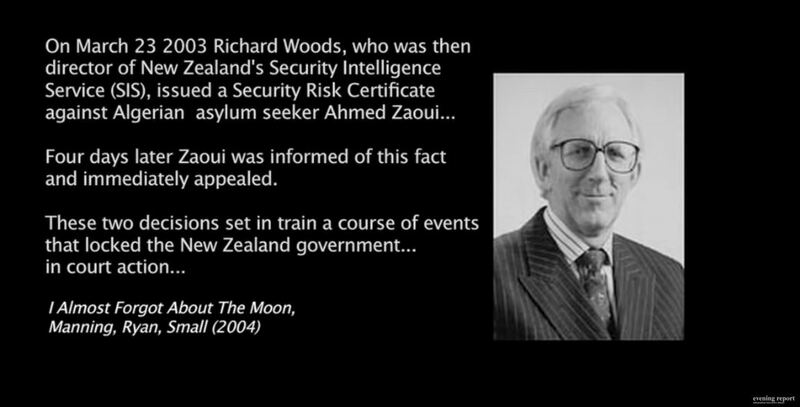 On March 23 2003, the then-Director of New Zealand’s Security Intelligence Service (SIS) Richard Woods issued the South Pacific Neo-Colonial State’s first ever Security Risk Certificate, finding that Ahmed Zaoui posed a terrorism risk to New Zealand. Zaoui was released on bail in December 2004 after a Supreme Court hearing, and lived with the Catholic community in the Dominican Priory in Auckland awaiting the hearing to review the certificate. That hearing did not take place until the winter of 2007. Because Zaoui had been locked up for two years, New Zealand’s Neo-Colonial Crown was able to inflict a vexatious, malicious propaganda campaign in the absence of conducting a thorough investigation, as is meant to be due to any human being. Due to this avoidance of following its owns statute laws, case law and its marketed image of overseeing liberal democracy, the Neo-Colonial stoked a multi-season psy-op news special. 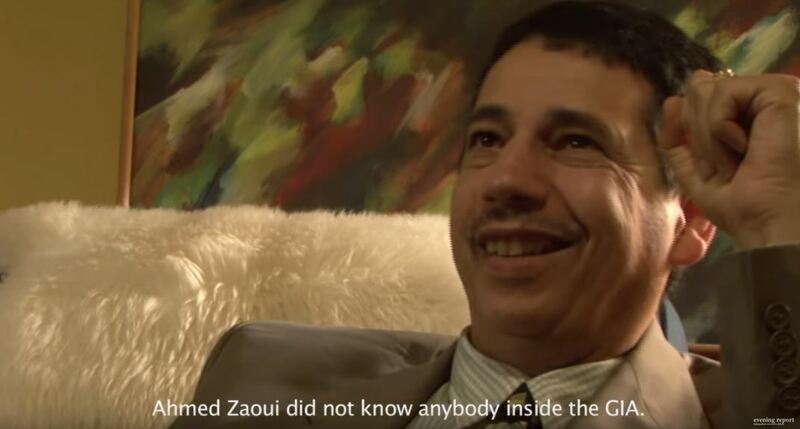 It turns out that New Zealand’s Security Intelligence Service (SIS) had relied on planted intelligence from Belgium, France and Switzerland based on a black flag operation produced by Algeria’s military intelligence agency, the DRS, to discredit Zaoui. 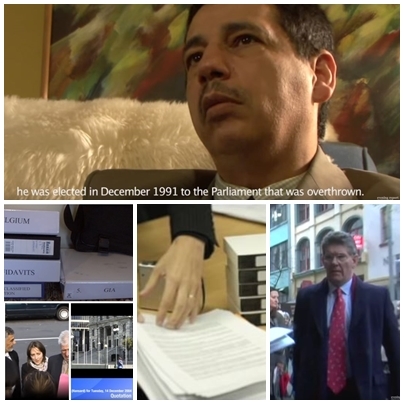 In mid-2007, the New Zealand Crown’s case against Algerian refugee Ahmed Zaoui collapsed because of secret witness testimony given by Algeria’s former head of intelligence and counter-espionage for Northern Europe, as the documentary Behind the Shroud Juxtapositioning Truth, Intelligence and Tradecraft shows. The Algerian security service agent, Lieutenant Colonel Mohamed Samraoui, produced his evidence in classified hearings showing that the asylum seeker had been framed for character assassination. Lieutenant Colonel Samraoui, a former assassin, was able to prove to New Zealand’s Inspector General of Intelligence and Security, Justice Paul Neazor, that the Security Intelligence Service (SIS) had relied on false information maliciously planted with their NATO counterparts. Secret Tribunal: In July 2007, New Zealand’s Intelligence & Security Committee heard former Algerian DRS agent Lt. Colonel Mohamed Samraoui’s testimony regarding his masterminding of the character assassination of Algerian-born academic Ahmed Zaoui. The Crown’s case against Zaoui had already been damaged when it became public knowledge that the director of the NZSIS, Richard Woods, had been New Zealand’s ambassador to Algeria based in Paris at the time when Zaoui was in Algeria, a former colony of France that appeared to gain independence after a revolutionary war from 1954-1962. Subsequently, the SIS Director Woods retired on Halloween in 2006 and was replaced by the director of the Government Communications Security Bureau (GCSB), Warren Tucker. 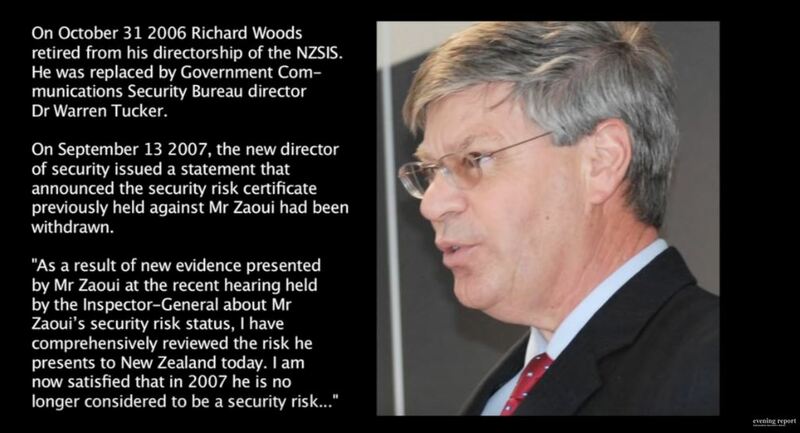 Deep State Easter Egg: SIS Director Warren Tucker, whose predecessor retired on Halloween 2006, freed Ahmed Zaoui on the Brotherhood’s favourite day of any month September the 13th in 2007 – without saying the NZ SIS had relied on the character assassination legend authored by the Algerian DRS, thereby signalling the New Zealand Deep State had another ‘poster boy’ in their ‘sights’. Moreover, Ahmed Zaoui’s dedicated defence team and helpers gathered counter-evidence. This effort included human rights lawyer Deborah Manning and immigration lawyer Matt Robson whom traveled to Europe to interview between 30 to 40 people and gather supporting evidence from people who either knew Zaoui, could ‘throw light’ on aspects of the story, or provide context on Algeria. This effort included interviewing Lieutenant Colonel Samraoui, the leading Algerian Deep State author primarily responsible for Ahmed Zaoui’s character assassination. However, neither Ahmed Zaoui, his defence team, the news media or the public were allowed access to these classified hearings in which Lieutenant Colonel Samraoui gave his damaging evidence to the Neo-Colonial Crown’s case. Ironically, New Zealand’s Neo-Colonial Crown appointed special advocate Stuart Grieve QC and Chris Morris. “It was like two parallel universes going on”. Parallel Universes: Human rights lawyer Deborah Manning said the mid-2007 hearings into the Security Risk Certificate review was resembled two parallel universes because only Zaoui’s Crown-appointed special advocates were allowed to discuss classified material. Lieutenant Colonel Samraoui stated he was the principal author of the false biography constructed for the character assassination of Ahmed Zaoui. This false bio became known as the ‘GIA Communiqué’, which was created by Algeria’s equivalent to the CIA, the Département du Renseignement et de la Sécurité – or DRS. The ‘GIA Communiqué’ claimed that Zaoui was a member of the Groupe Islamic Armé (GIA), which had adopted violent tactics in 1992 after the Algerian military junta voided the 1991 election results. The GIA itself was infiltrated and manipulated by the DRS, Lieutenant Colonel Samraoui said. Fixing the Frame-up: Lt. 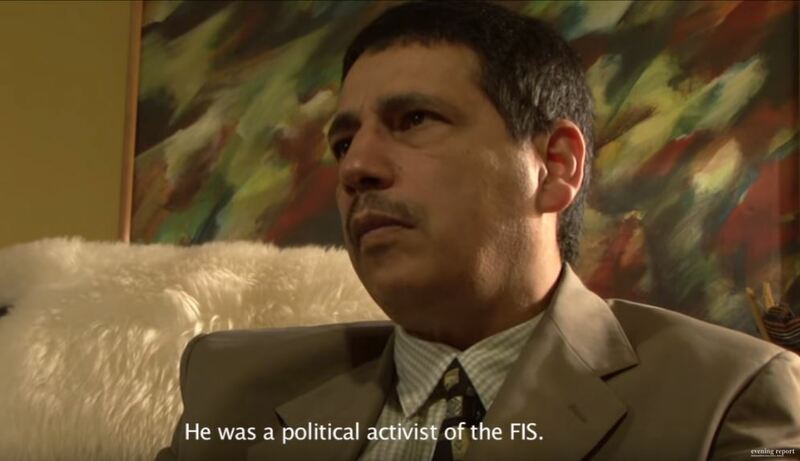 Colonel Mohamed Samraoui stated former Algerian politician Ahmed Zaoui’s big mistake was that he was a member of the Islamic Salvation Front (FIS) political party, and as an academic in Europe, he was being taken seriously. Incongruously, the ‘GIA Communiqué’ also claimed Zaoui was the GIA head of the caliphate government in exile. A caliphate is an Islamic government lead by a religious successor or steward to the prophet Muhammad that traditionally ruled a transnational multiethnic empire. The GIA dossier was incongruous because the structure of this apparent government in exile replicated the government structure in Algeria, complete with the same ministerial positions but with the names changed to frame enemies of the state. In other words, the DRS had used the existing Algerian secular government structure as a template to fix the narrative of violent Islamic religious fundamentalists plotting a coup d’état takeover of Algeria from Europe. In fact, the DRS became scared that Zaoui would be taken seriously sewriously in Europe, persuade other to join the non-violent, peace advocating and law-ward Islamic Salvation Front (FIS). With a devilish smirk, Lieutenant Colonel Samraoui says the DRS sent the ‘GIA Communiqué’ to European media. The inference is that the news media reproduced the false legend of Zaoui on a presumptive accuracy basis without investigating because the material originated with an intelligence service aligned with France, Belgium and Switzerland. 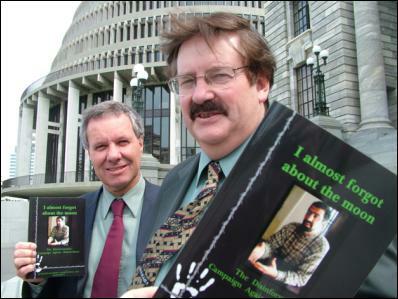 NZ Crown Cover-up: NZ’s Inspector-General of Intelligence & Security, Paul Neazor, NZ SIS Director Warren Tucker and NZ PM Helen Clark avoided spelling out to New Zealanders that Ahmed Zaoui had been framed as a terrorist by the Algerian secret service, principally Lt. Colonel Samraoui. Yet, Lieutenant Colonel Samraoui was a principle player in the legend that Zaoui created a terrorist organization. New Zealand’s Police-Intelligence-Surveillance-Security-State apparatus faced an imminent threat to its credibility following the collapse of this expensive, long-running Zaoui case. 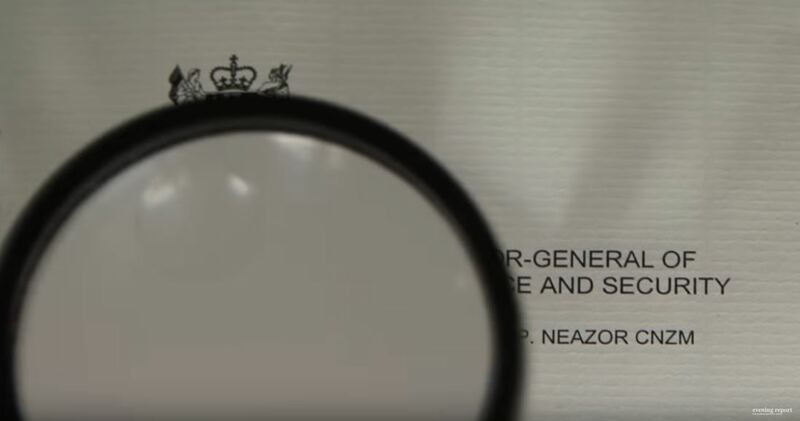 If classified evidence leaked about why the Crown was forced to let Zaoui go after almost five years, the reputation of New Zealand’s security-intelligence-surveillance services would have been severely diminished. At this time, amendments to the Terrorism Suppression Act of 2002 were going through parliamentary select committee processes. Parliamentary lawmakers such as Keith Locke, who had first raised concerns over Zaoui’s case, needed to be overwhelmed with fast-moving deep state conjured events, or speed politics, where the spectacle presented in news sheets, screens and scripts is the evidence for framing targeted scape-goats. 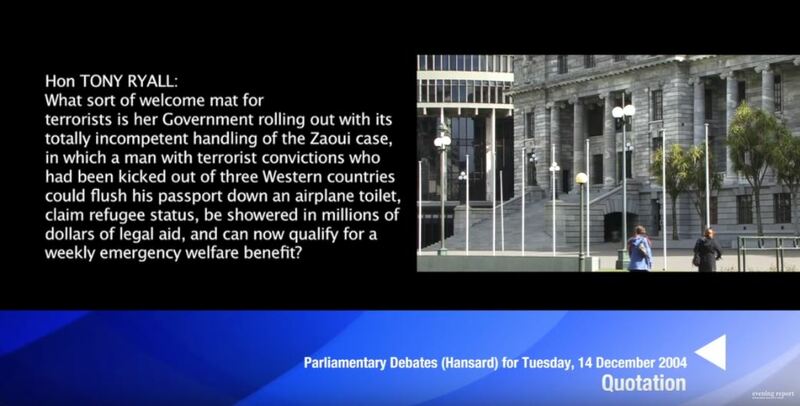 Stoking the Flames: National Party MP Tony Ryall suggested NZ had a welcome mat for terrorists. Responding with Subterfuge: NZ PM Helen Clark bragged about Zaoui’s incarceration without trial. It was Lieutenant Colonel Mohamed Samraoui’s testimony, given in classified hearings held by New Zealand’s Inspector General of Intelligence and Security, Justice Paul Neazor, which resulted in the New Zealand Government releasing Ahmed Zaoui with little explanation. The Crown Law’s legal services cost $1.3 million. Embarrassing Disclosure: Opposition National MP Murray McCully asked why an immigration official had reportedly said everyone agreed to lie about Zaoui. 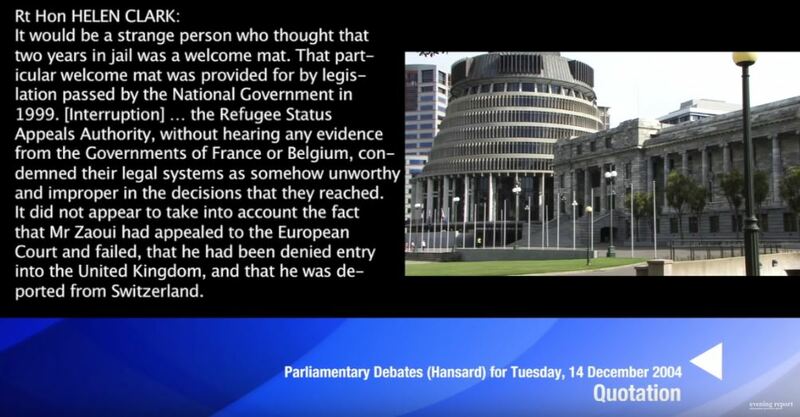 Denial of Denials: Clark-Labour Government Immigration Minister Lianne Dalziel claims there was no conspiracy without supplying any substantive counter-evidence. The record shows that a statement from then-Director of the NZ Security Intelligence Service, Warren Tucker, on the Deep State Easter Bunnies’ favourite day of any month, the 13th of September 2007, failed to satisfactorily clarify that Ahmed Zaoui had been framed for character assassination by Lieutenant Colonel Samraoui. Because Warren Tucker left Lieutenant Colonel Samraoui’s part in framing Ahmed Zaoui classified, he was able to get away with insinuating that Zaoui had been guilty of “participating in and leading terrorist networks” in France and Belgium, and that his deportation from “Switzerland for issuing statements supporting violence in Algeria and attracting extremists” were legitimate records of Zaoui’s life. Therefore, New Zealand’s Deep State rabbit warren was left-free to double-down in their efforts to expand their power. The task to explain why the Clark Government simply released Ahmed Zaoui with little explanation in 2007 was left to journalist and documentary-maker Selwyn Manning, who traveled to Europe to interview Lieutenant Colonel Samraoui. 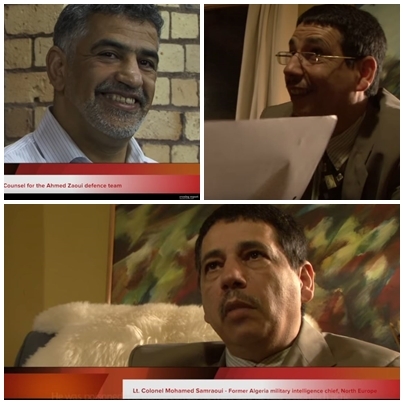 Lieutenant Colonel Samraoui told journalist and documentary-maker Selwyn Manning it was standard procedure in security risk assessments to decide the suitably for action against a political target on a spectrum from character assassination to actual assassination – weighing the risks with the threats the targets were perceived to pose to the structures of power. Prove you are not a Robot – Click images containing character assassins: Lt. Colonel Samraoui said when intelligence agencies conduct security risk assessments, the risks of dealing with the threat are weighted and matched on a spectrum of options, from character assassination through to actual political assassination. Next Poster Boy Frame-up: NZ’s Deep State scapegoated Tame Iti by casting him as a terrorist guerilla leader to avert looming crises by riffing off movies such as Sleeping Dogs. Once the multi-season psy-war to frame Zaoui collapsed, this meant the national security state had lost their ‘poster boy’ for the ‘Global War on Terror’ in New Zealand. By being forced to free their ‘poster boy’, the national security state faced a looming crisis of legitimacy at a time when amendments to the terrorism Suppression Act were before a parliamentary select committee. This credibility crisis converged with the Crown’s looming crisis that it had zero legitimacy to deny Tūhoe the return of the Urewera wilderness. To confront this convergence of crises, the Crown’s Deep State deftly deployed its scripted B-Grade multi-season News Special psy-op – Operation Eight and was effective enough to achieve its broad objective: to save the realm from a catastrophic collapse of Crown credibility. Parliamentary lawmakers such as Keith Locke, who had first raised concerns over Zaoui’s case, needed to be overwhelmed with fast-moving deep state conjured events, or speed politics, where the spectacle presented in news sheets, screens and scripts is the evidence for framing targeted scape-goats. Thus, just one month later, New Zealand’s Deep State would inflicted a mass character assassination that relied in part on the intelligence gathering of private investigation firms, as journalist Nicky Hager’s investigations in late 2007 and early 2008 showed. Deliberative Circumspection vs Speed Politics: Politicians Keith Locke and Matt Robson were outgunned in seeking full disclosure on the character assassination of Zaoui. These developments led directly to the New Zealand State’s Police-Intelligence-Spy-Security apparatus opting to prosecute the Operation Eight raids of October 15 2007 across the North Island. These raids occurred even though the Special Intelligence Group at Auckland’s Metro Crime Services found there was no terrorist plot. Coming soon: Meet real-life NZ Deep State Easter Bunnies down the rabbit hole in Part 2 and 3 – as New Zealand’s national security state scapegoat the next ‘poster boys’ in the War of Terror era – Tame Iti and Kim Dotcom – to resolve more crises & feed the New Zealand Crown’s addition for multi-season psy-war news specials!!! Despite a directive from then-Prime Minister Helen Clark to Solid Energy and all other state-owned enterprises and departments to desist from using private sector spies to infiltrate activist groups with informants, the Operation Eight police raids had relied on information supplied by a paid-police informant, Rob Gilchrist, who lived a double-life as an ‘activist’ for nearly 10 years. As activist and author Valerie Morse told 3News in mid-December 2007,[vi] following journalist Nicky Hager’s scoop of the Gilchrist story, “Crossing the Line – The activist who turned police informer”,[vii] Gilchrist had informed on at least three of the Operation Eight accused and had tried to get her to commit burglary and make bomb threats. Hager’s “Crossing the Line” story followed on from three prior stories: “I was paid to betray protestors” (May 27, 2007), which he followed up with, “Private Investigators still digging on West Coast” (April 20 2008), and “Coal mine spies return despite govt ban” (April 20 2008) – that showed private investigators Thompson and Clark had sought to infiltrate left-wing activist groups. As former intelligence and defense policy analyst Dr. Paul Buchanan said in the Operation 8 documentary, Gilchrist was acting as an agent provocateur.